Are you a gun enthusiast? Love your time at the range? Well we have a great bag for you that is perfectly capable of carrying everything you need for your next trip there. A bag that claims all that must be good. The 3S Tactical Range Bag comes with 6 main compartments including a double zipper, and the main compartment measuring 18"x10"x10", you know it's got the space and capability to handle it all. It has a 15"x8"x6" padded ammo bag with 2, count 'em, 2 zippered side pockets. It boasts a large external pocket with 8 pistol magazine holders, which also has an internal padded large pocket. Mainly, the inside compartment has 2 padded pockets to hold and protect that precious pistol of yours. The durable nylon carry handle makes it easy to walk into the range with your bag and all belongings in one place, and even has a velcro closure to keep it all together. But if you're more of a shoulder-strap person, no problem, then you'll love the additional shoulder strap it comes with. 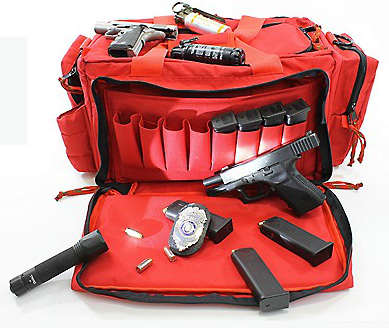 This bag even conveniently has a bottle holder so you can stay hydrated and cool at the range, places for you to put personal belongings, and the choice of black or red. Next time you find yourself heading to the range, come with the 3S Tactical Range Bag fully stocked with your favorites, you won't be sorry.